Gout is one of the most frequently referenced medical disorders in the history of mankind. Gout is the result of an abnormality of the body's ability to process uric acid. Uric acid builds up either because of too much uric acid intake (from rich foods such as chocolate, seafood, or red wine) or the body's inability to process it. The uric acid then crystalizes in the joints - mainly the toes, ankles, hands and wrists - causing the painful inflammation of a gouty attack (gouty arthritis). In severe cases, increased uric acid can cause kidney stones and blockages of the kidney filtration system (tubules), and permanent damage to the kidney or even kidney failure. Gout is more common in men than in women. It is also more common later in life with most patients having attacks after the age of 50. 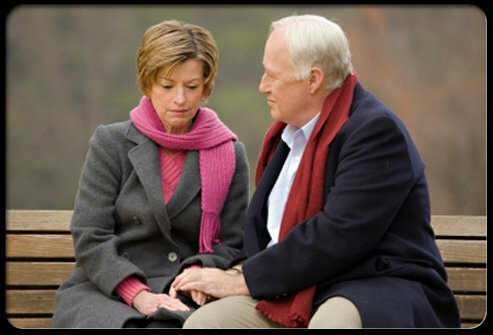 If your parents have gout then you are also at increased risk of getting gout yourself. Some medications such as diuretics (water pills), and having low thyroid hormones may also be risk factors for getting gouty attacks. 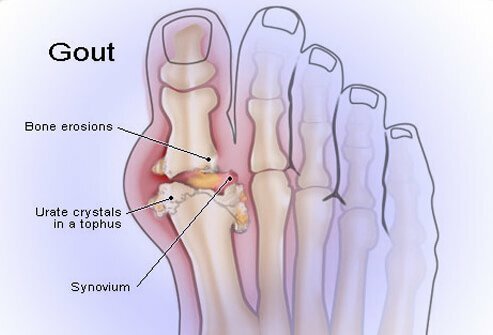 The large joint at the base of the big toe (first metatarsalphylangeal joint) is the most common site for a gout attack, however, any other joint can be affected. Most commonly other joints affected are the ankles, knees, wrists, fingers, and elbows. Patients with gout attacks suffer a rapid onset of pain in the affected joint followed by swelling, redness, and severe tenderness. Some experience pain so intense that even the light touch of a bed sheet on the joint is excruciating. These painful attacks can last from hours to several days. In cases of chronic inflammation the attack may last for weeks. Unfortunately, patients with gout are at risk for repeated attacks of gouty arthritis. The large joint at the base of the big toe (first metatarsalphylangeal joint) is the most common site for a gout attack but other joints commonly affected are the ankles, knees, wrists, fingers, and elbows. Inflamed lumps of tissue may form in the joint with repeated bouts of gout or prolonged cases. These lumps are called tophi. Some of the larger joints of the body have a fluid-filled sac around them that act as a shock absorber called a bursa. A bursa also helps with the movement mechanics of the joint. 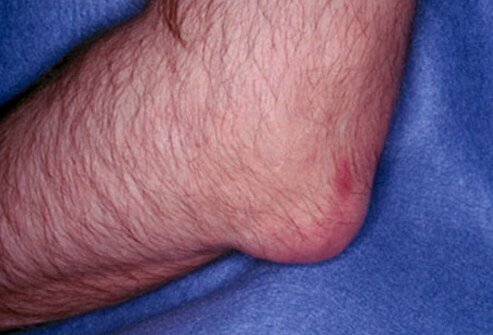 If gout causes inflammation and swelling of the bursa it is called bursitis. Gout is usually diagnosed by a doctor based on the location of the inflamed joint and a history of having similar non-traumatic attacks of pain and swelling. 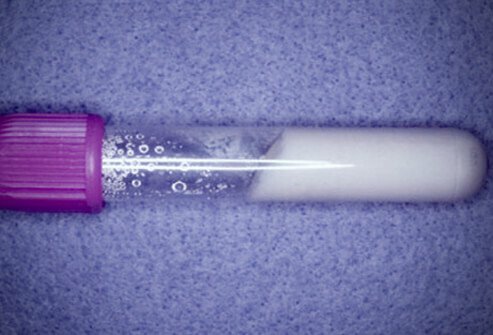 The most reliable (but not always necessary) test for confirming gout is an arthrocentesis. 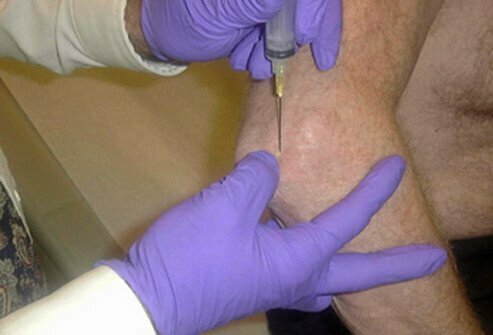 Arthrocentes is a procedure where fluid is withdrawn (aspirated) from an inflamed joint with a needle and syringe, using a sterile technique and a local anesthetic such as lidocaine. The fluid is sent to a lab where it is analyzed for the presence of uric acid crystals. The fluid withdrawn by an arthrocentesis is analyzed in a lab under a microscope for the presence of uric acid crystals. The fluid analysis can also rule out other causes of inflammation including bacterial infections. 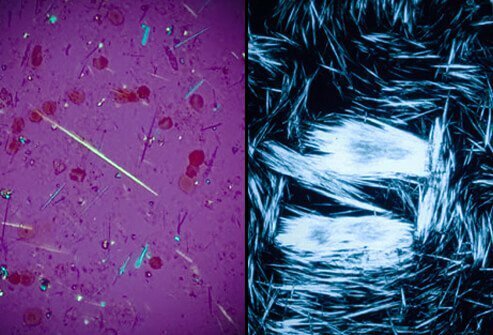 Needle-like uric acid crystals are best viewed with a microscope. 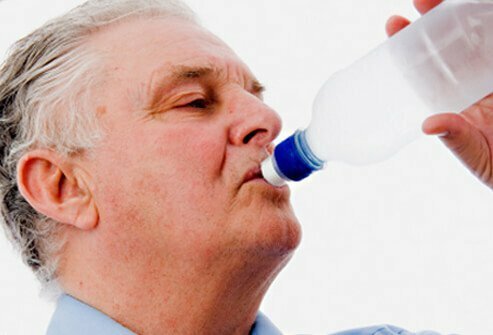 Staying well hydrated is the best way to prevent gout attacks. Drink plenty of water throughout the day. Proper hydration also decreases the risk of kidney stones or kidney dysfunction as a result of built-up uric acid. Avoid alcohol or only drink in extreme moderation if you have had gout attacks in the past. Alcohol affects the body's metabolism of uric acid and can cause it to build up (hyperuricemia). If levels of uric acid build up in your system it can precipitate a gout attack in your joints. Foods rich in purines such as shellfish or organ meats (liver, kidneys, brains, sweetbreads) can lead to gout attacks. The body converts purines into uric acid, which in turn leads to gout attacks. 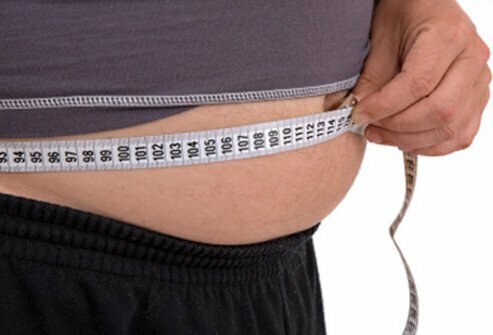 Overall weight reduction is also a way to avoid gout attacks. 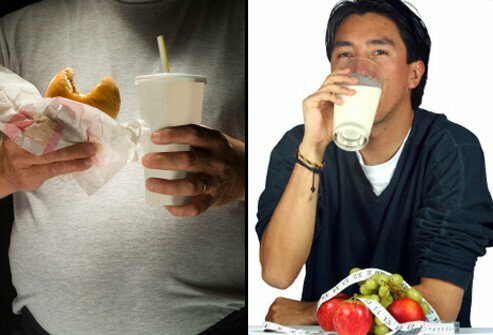 A diet low in fats and calories, combined with a regular exercise regime can help decrease the likelihood of a gout attack. Gout is a very painful condition. Pain relievers and anti-inflammatory medications are the mainstay of treatment for gout. Nonsteroidal anti-inflammatory drugs (NSAIDs), colchicine (Colcrys), and corticosteroids are used to decrease joint inflammation. 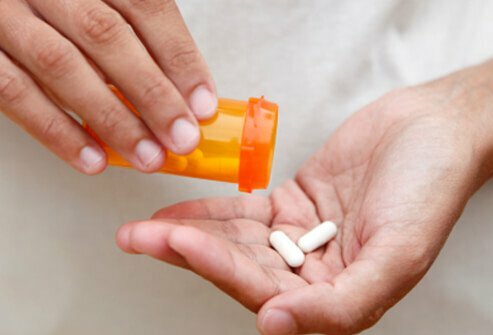 Other medications such as probenecid (which helps the body excrete excess uric acid) and allopurinol (Zyloprim, Aloprim), (which decreases the amount of uric acid formed by the body) are used for managing the underlying metabolic derangement that causes hyperuricemia and gout. These medicines decrease the elevated levels of uric acid in the blood. Research is ongoing to find new strategies to prevent gout. New drugs are being developed to keep the body from having high uric acid levels and decrease the likelihood of a painful gout attack. Images reprinted with permission from eMedicine.com, 2008 (foot/hand x-ray). Images reprinted with permission from eMedicine.com, 2008. 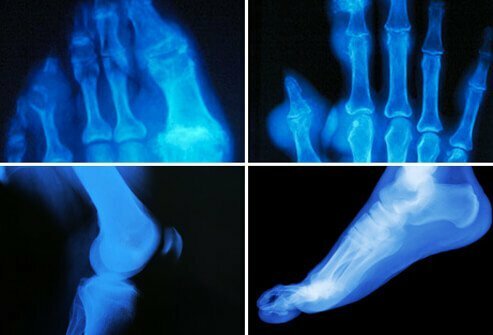 Centers for Disease Control and Prevention: Gout"
National Institute of Arthritis and Musculoskeletal and Skin Diseases (NIAMS): Questions and Answers About Gout"